Area Covered 30 sq. mtrs. Height 1.7 M To 2.0 M.
With Spin mist technology, our Mist Fans Rental Service is no ordinary fan and flaunts incredible features that make you like it instantly. This oscillating fan can reduce the room temperature by several degrees and is extremely effective. It emits mist up till 8 hours due to its water supply capacity and also, it can be used in hard water. 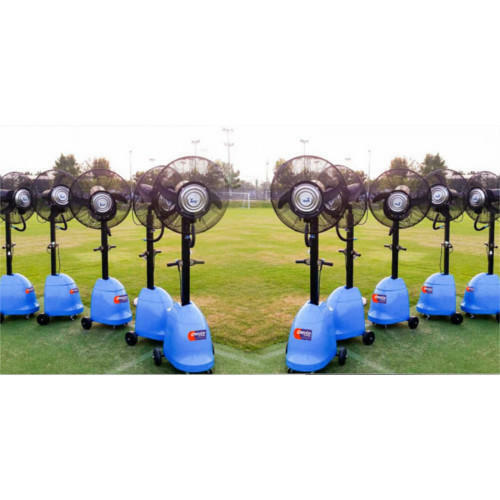 Interesting fact of Mist fan is that one can adjust its height and can move it from one place to another effortlessly as it is equipped with wheels. This fan serves its purpose effectively in outdoor weddings, functions, and events that are held in spring or summers. These products are always in high demand and if you want to know more about it, contact us immediately.